2017 has been an amazing year for Blue Fern Studios. We have introduced new paper collections, added many new chipboard and stamp designs, and our new Seedlings. 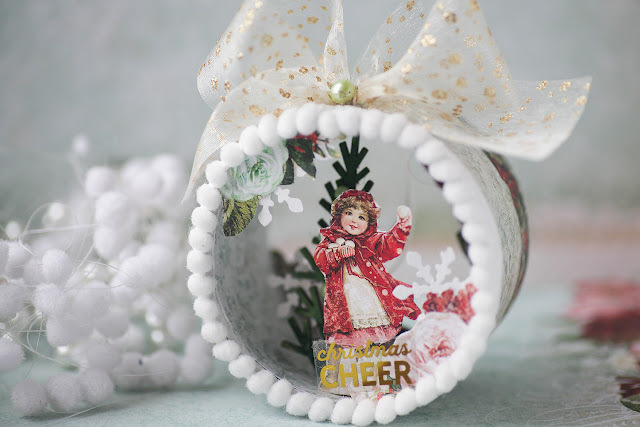 Each week on our blog and social media sites, we have shared gorgeous projects from our talented Design Team. As we say goodbye to 2017 and move on to 2018, we want to thank each of these amazing women. They are so very creative and put their hearts into each project they create. Our first layout was created by Babi Kind. 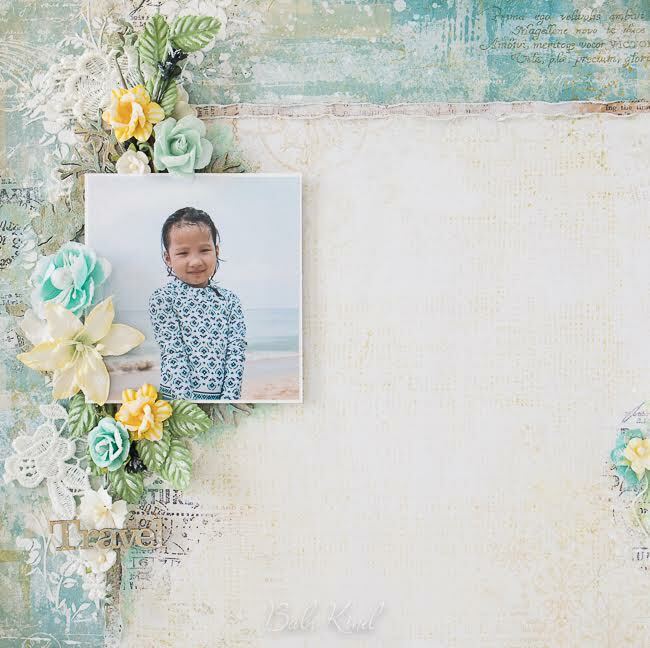 Babi selected this layout as one of her favorites of 2017 and said, "I can't believe this year past by so quickly. I'm so grateful to have had the opportunity to share some of my work with you and to work with this amazing and talented team. There were so many nice collections and projects and it was hard to choose a favorite from 2017. For some reason, maybe because I've spent a large part of my life in a tropical country, I like creating summer projects. The color, textures, and everything from summer makes me happy and energized. This layout reminds me of a great time we had this year traveling with my daughter, discovering new things and enjoying the beautiful weather." Tartine told me that she spends a lot of time when creating a layout, and I think you will see that below. When she sent this layout to me, she said, "It's really hard for me to choose my favorite layout, and especially to say why she is my favorite. I think it's this one because it reminds me that we must never give up our dreams and believe in ourselves Thank you so much BFS for make my dream come true." Pascale couldn't choose which layout was her favorite, so she sent me a couple to choose from. I selected this beautiful monocromatic layout. 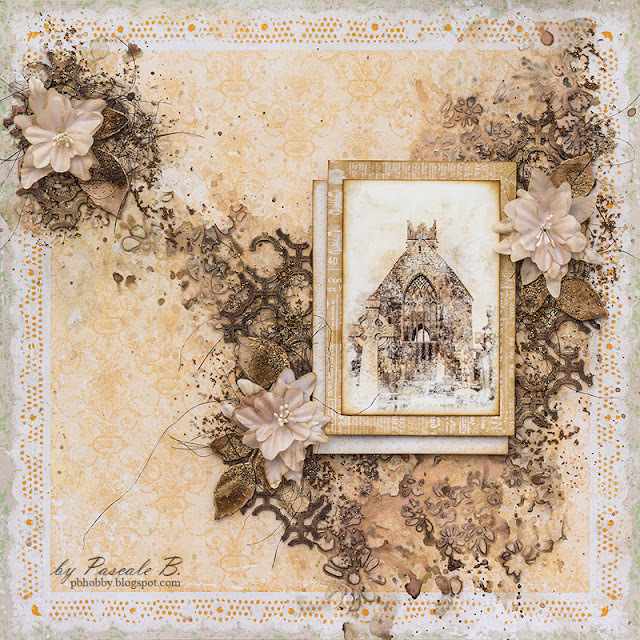 Pascale is known for creating layouts using images of magnificent buildings. This photo is a view from the Monastery of Claregalway that was taken during her trip in Ireland. 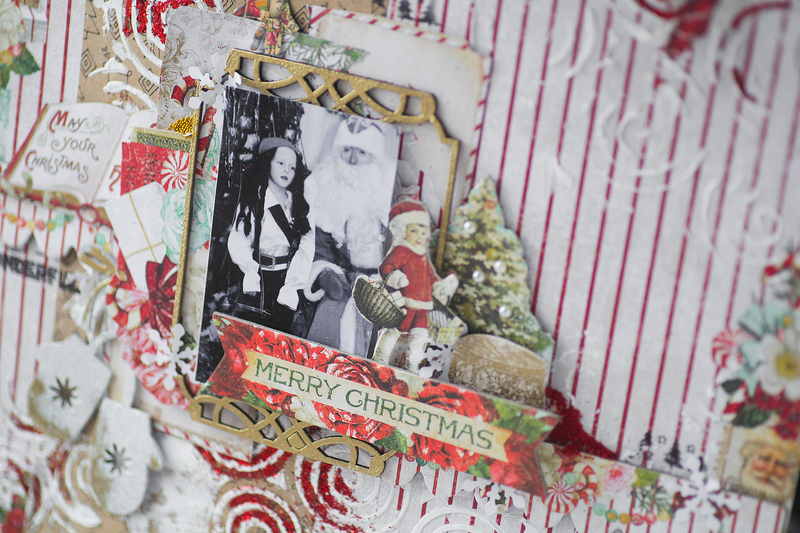 Vera also couldn't choose her favorite layout, but sent me several to choose from. 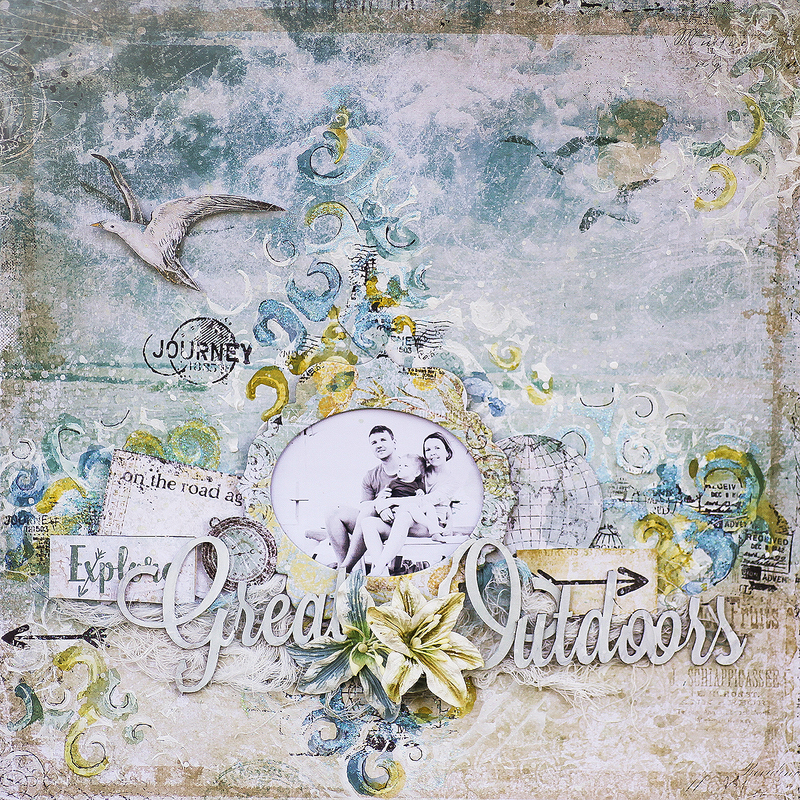 I chose this one using paper from the beautiful Seaside Cottage collection. I absolutely love the movement she created in her design. 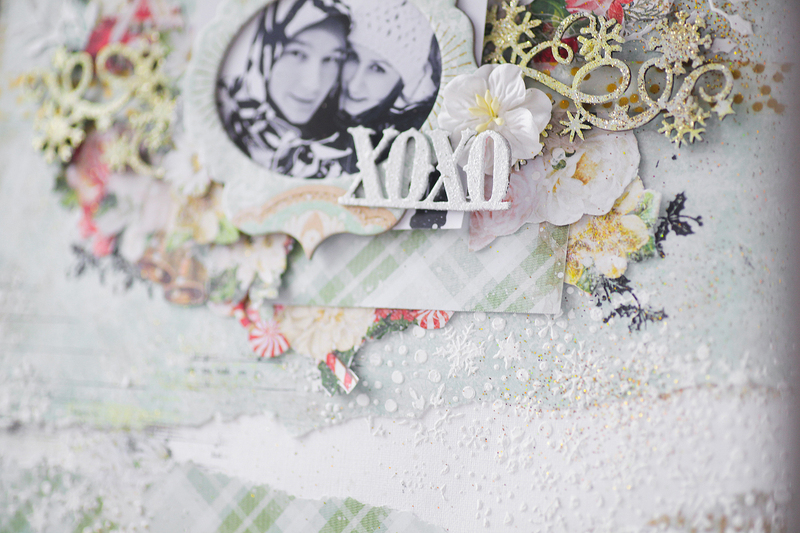 Annie let me select one of my favorite layouts that she created. When I saw this one, I immediately knew it was the one. The stunning design is fresh and unique. 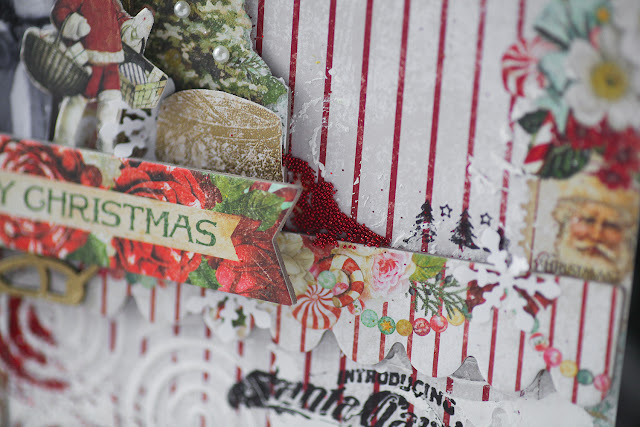 Annie used the beautiful designs on the paper and highlighted them. I chose this layout from Catherine. First is the amazing background she has created. 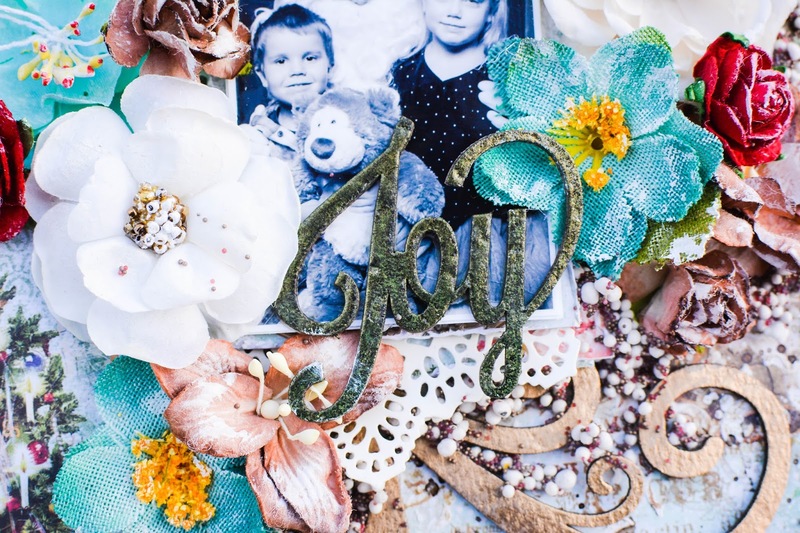 I love the way the gold embossed chipboard looks against the background, and all the lovely Blue Fern flowers that frame this adorable photo. 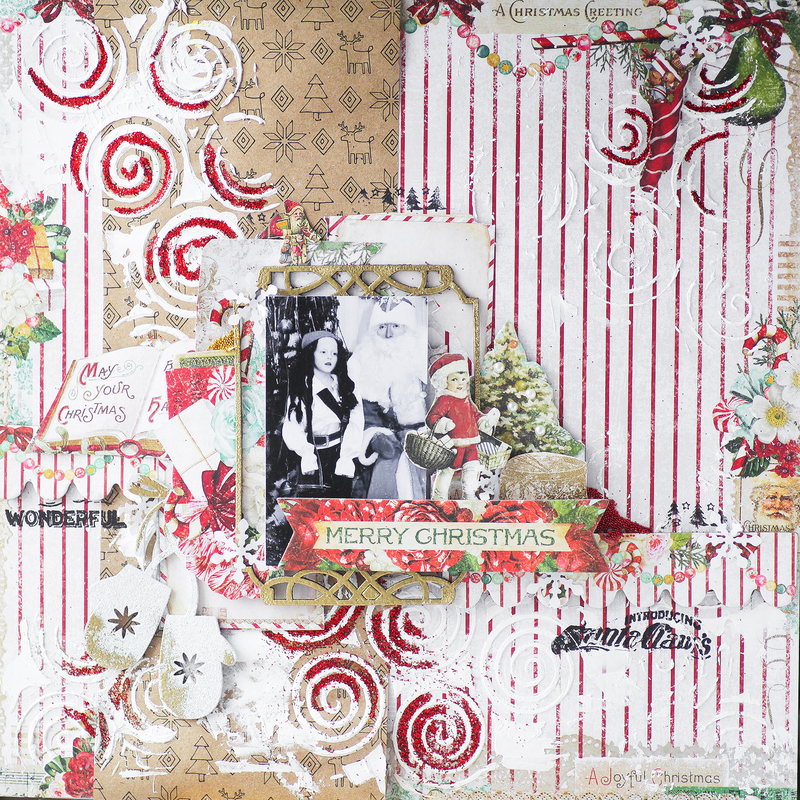 Wendy created this sweet layout which was my favorite. Every piece of this design fits exactly where it needs to - and brings the entire thing together. The harmony of colors are perfect with this fun photo. It has been an amazing year and we are so blessed to have spent it with such an amazing group of creative women. Thank you to all of you for your inspiration! 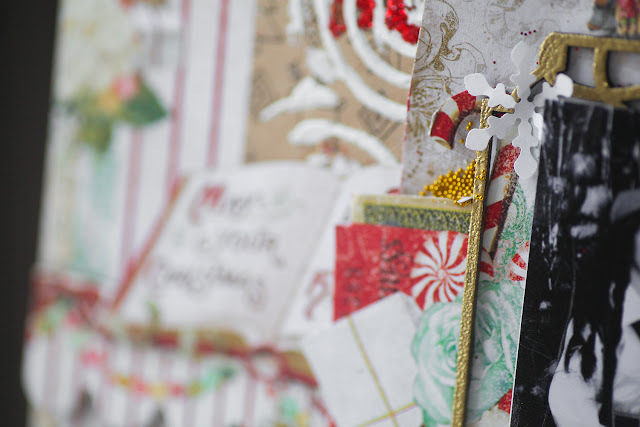 Merry Christmas to all Blue Fern Studios fans all over the world! Let me share some sparkling Christmas layouts and one extra off the page project which I'm sure you will enjoy. First I'll share a very festive layout made with the brand new Remnants collection. I've used Remnants - Beaumont dark side as background and some Remnants printed chipboards in decor. 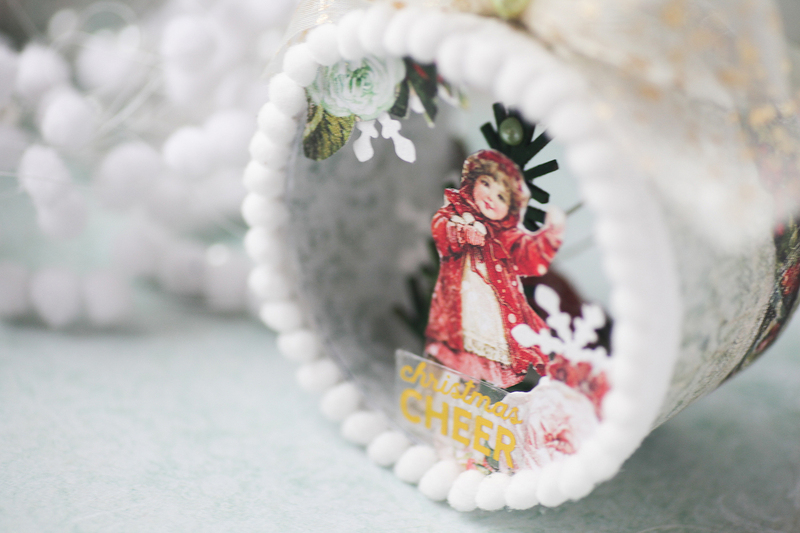 hat from Cozy Christmas set, Holiday Treats, Holly Sprigs, Winter flakes and the title. 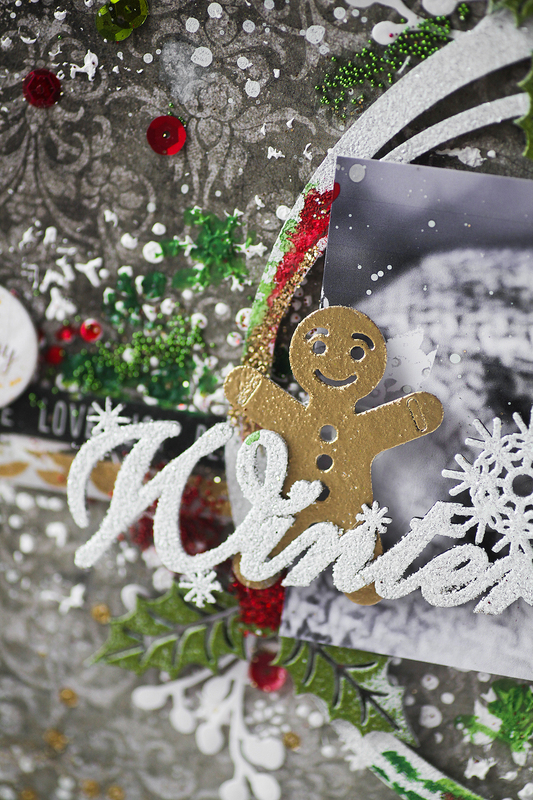 The gingerbrad man is covered with Antique gold Embossing powder. Holly springs are covered with Avocado embossing powder and the circle frame with Glistening sand. I have two more layouts with both Vintage Christmas collections. These are gifts for my good Instagram followers. This one is very tender and full of sweet romance with Vintage Christmas - Auld Lang Syne as background. 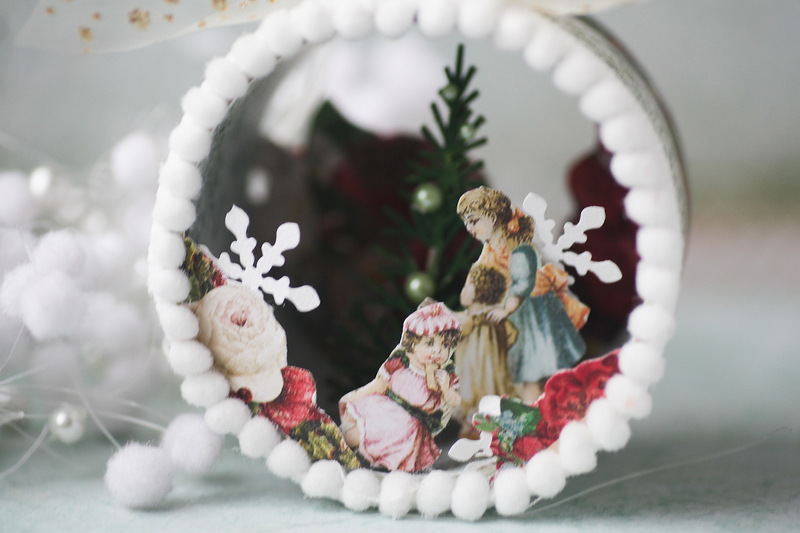 And the frame is taken from the new Vintage Christmas printed chipboards set. 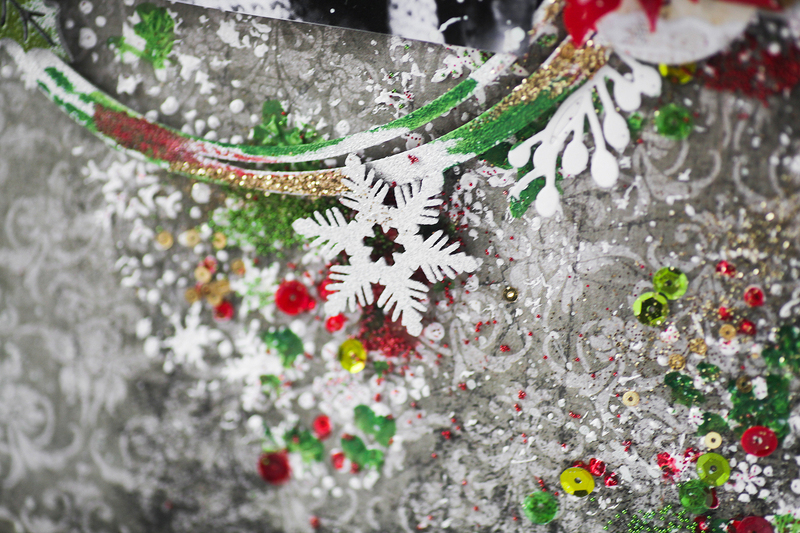 I added Snow Medley and covered it with fools gold glitter. 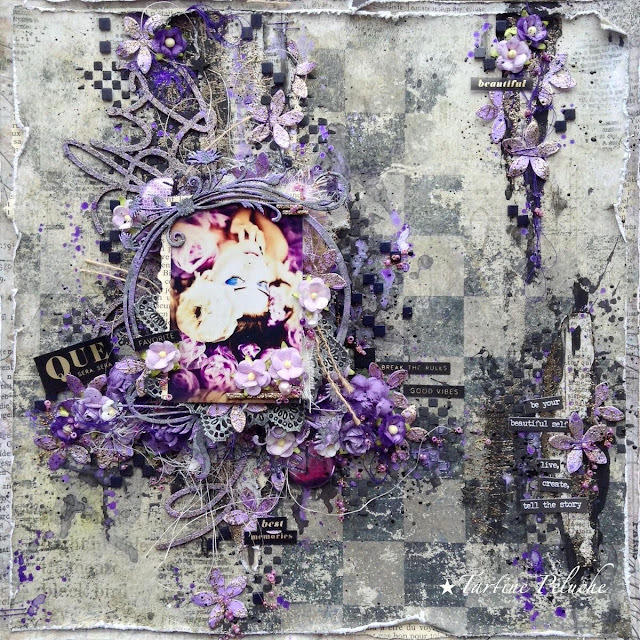 Therelayout is embelished with bits of fussy cut flowers from different collections. 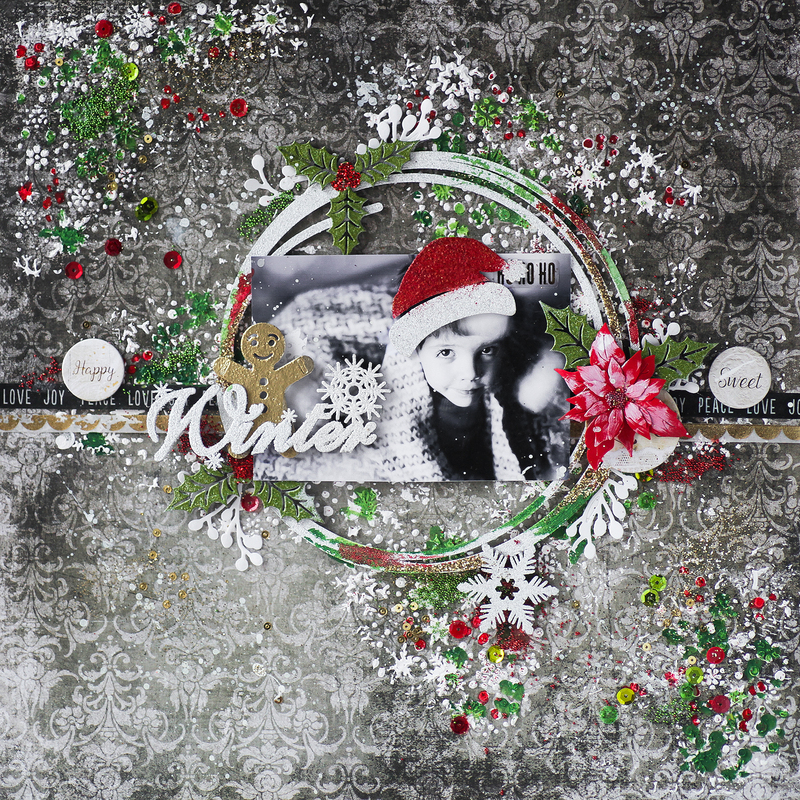 The black and white photo demands some contrast black elements, so I added some stamping with Holiday Wreath. And the title Heartland hoho chipboard perfectly fits the story. 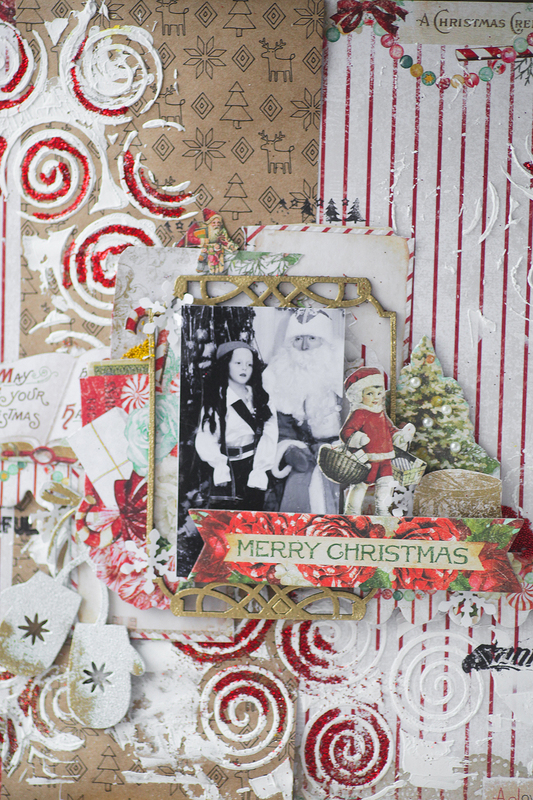 One more Christmas layout and it seems the stories and pictures are never ending ) It was such a fun mixing Vintage Christmas 2 - Holiday treats paper sheet with fussy cut elements from Holiday cards. 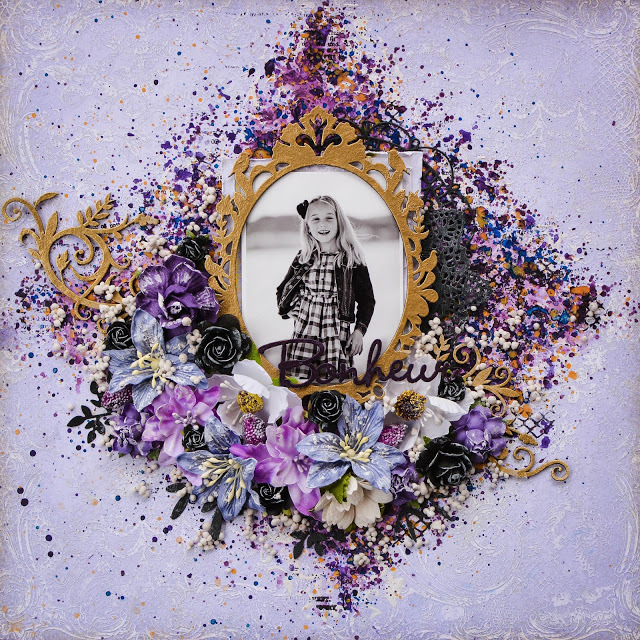 The photo is framed into Sweet Home Vignette chipboard covered with Antique gold embossing powder. And for the dessert I prepared a couple of crafty fir tree toys made of adhesive tape bobbins. They are so tiny and cute! 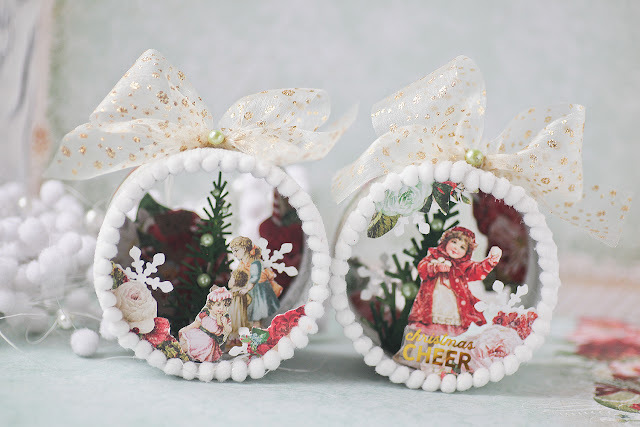 I decorated inner parts with trees from Winer forest chipboards set and characters cut from Vintage Christmas holiday cards. 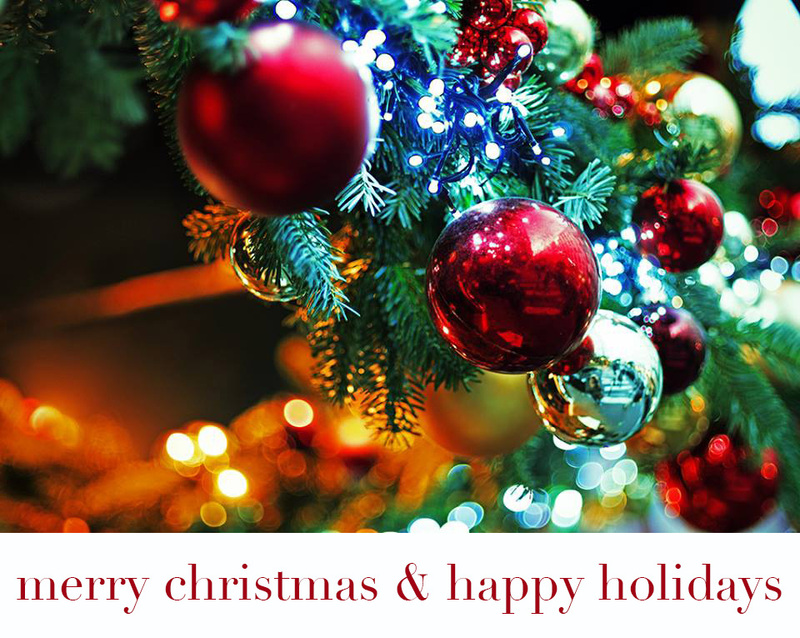 I wish all of you a very Merry Christmas and Happy new year! Hello Blue Fern fans. 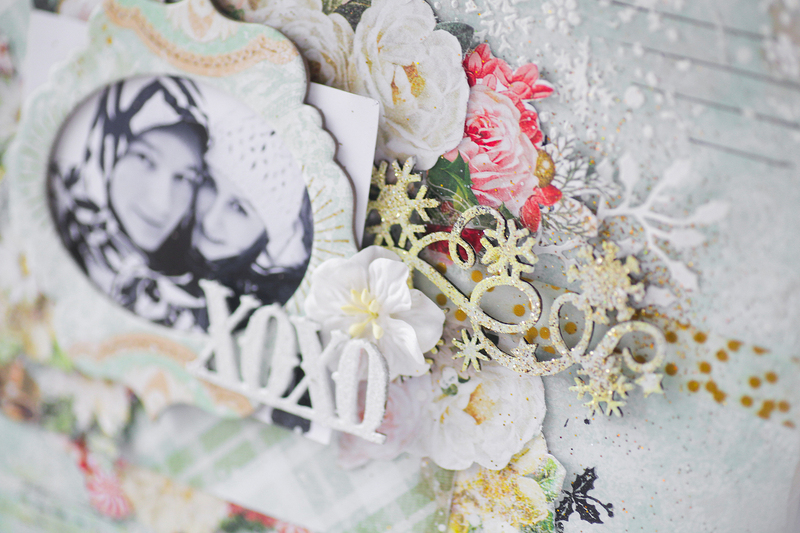 Today we post the final layout from our December Blue Fern Fan of the Month, Vija Anton. 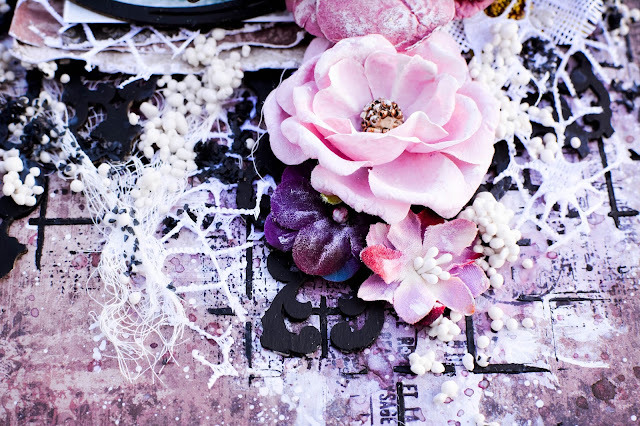 We have fallen in love with each of her unique projects this month, and can't wait for you to see this one. 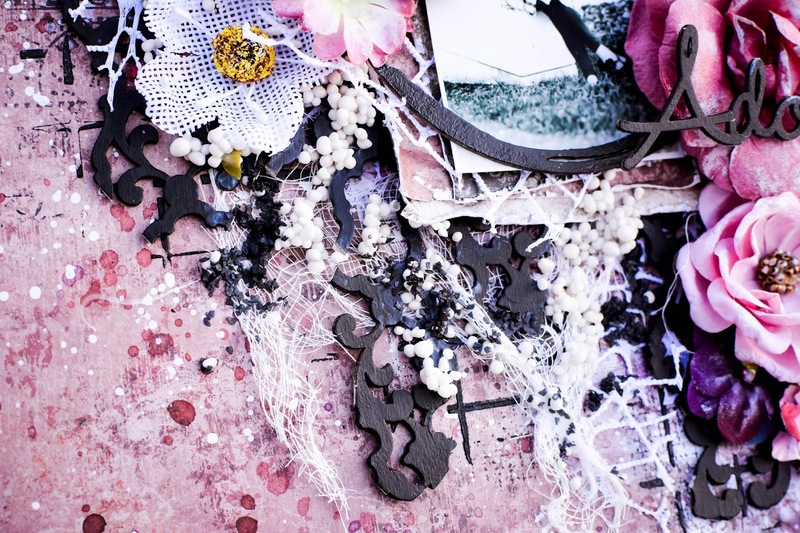 Vija, it has been such a joy to have you create with us this month. You have given us and our readers some awesome inspiration, and we were able to give you some mojo to begin creating again! This is my last layout as Blue Fern's Fan of the month. 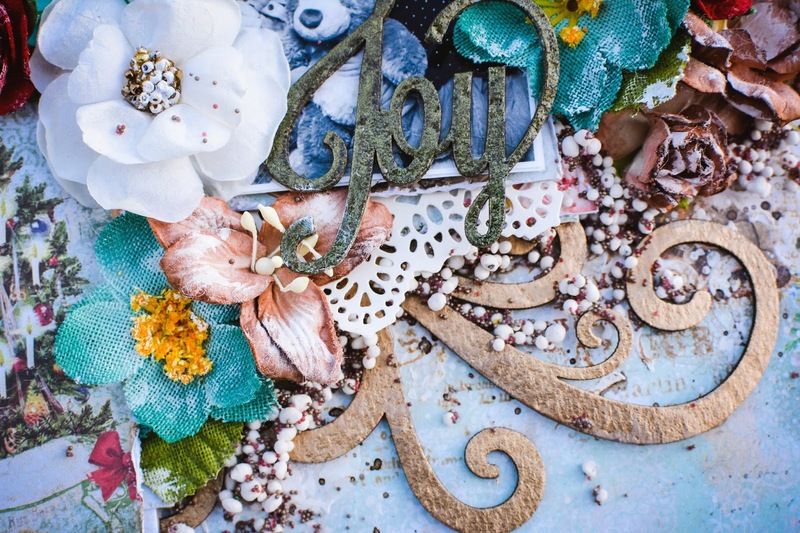 Thank you Blue Fern Studios for giving me this opportunity to work with your beautiful products. 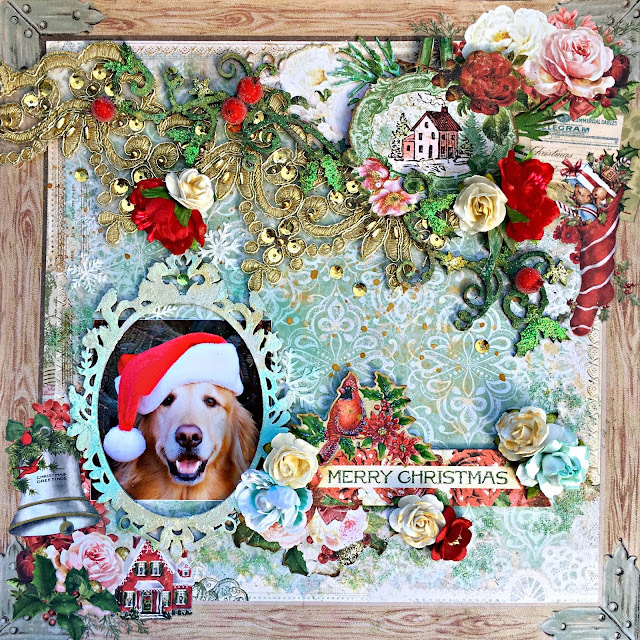 This layout features a facebook friend's dog, Finn. I will be sending her this layout so I hope she likes it! 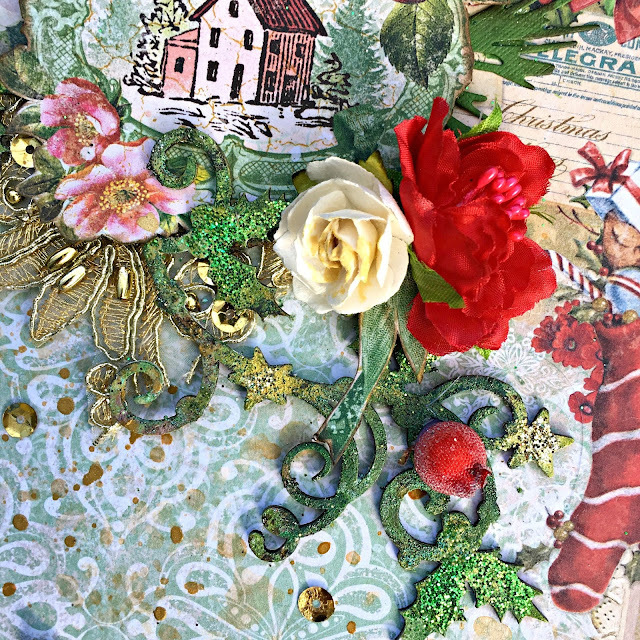 For the background I used the Magical paper and used the Wonderland and Homegrown papers for some fussy cutting. I love how these two collections compliment each other so well. I have created dimension on my page by layering the elements. A double layer of foam tape under the cut out frame helps it sit nice and flat on top of the chipboard and that gorgeous lace. 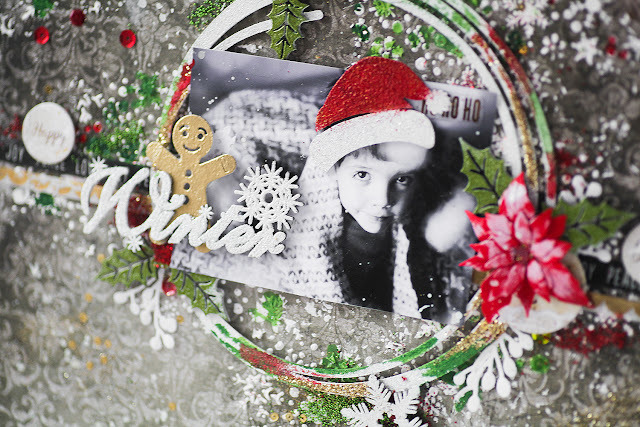 I added touches of glitter here and there to give my layout a real Christmasy feel. For me Christmas = glitter and sparkle!!!! Hello BFS fans! It's been a year since I had the chance to be part of the Blue Fern Studios Creative Team. I had a blast. But now, it's time for me to say goodbye and thank you to Valerie and Leslie for this incredible opportunity. I have two last layouts and a video tutorial to share with you, I hope you will like it! 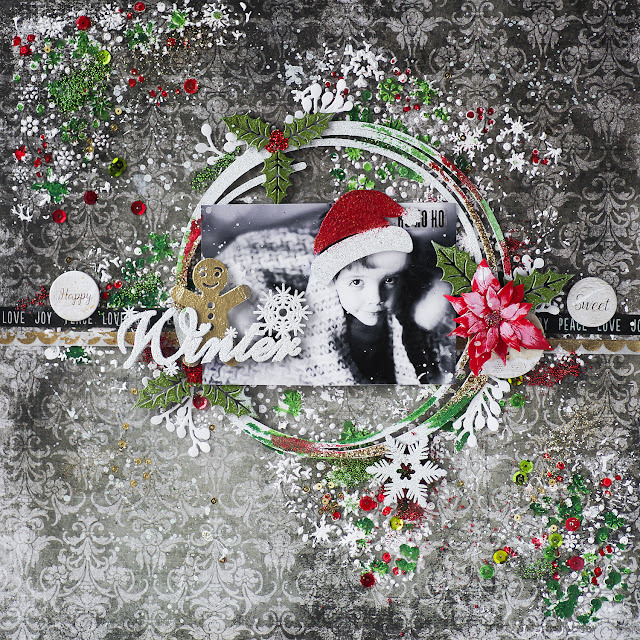 I cut my paper Vintage Christmas Auld Lang Syne in two pieces and then I glued them on a 12 x12 chipboard. 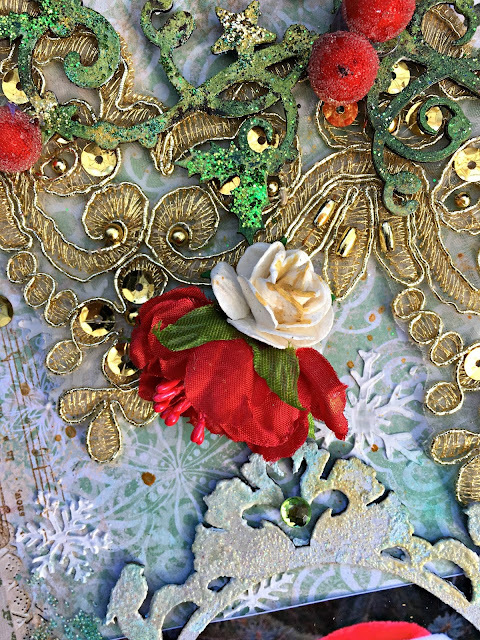 Then, I did a textured background with a stencil and modeling paste. I add brown ink and I stamped many details with brown ink again. 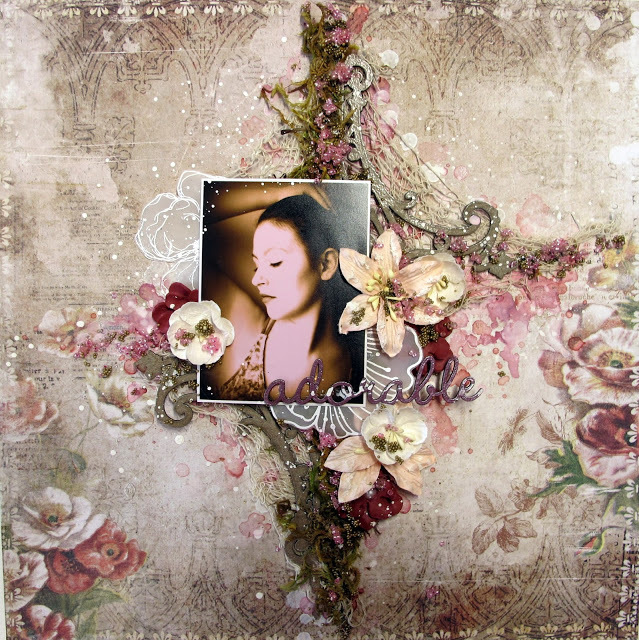 I embossed the Frame Collage and the Blooming Flourishes chipboards with Ginger embossing powder. I embossed my title with Forest powder. Then, I add flowers and texture with Burgendy and Twig Seedlings. 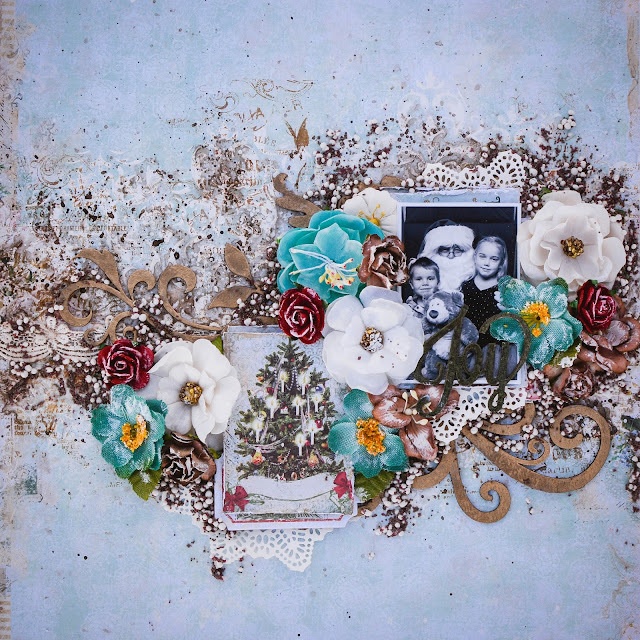 For this layout, I used the gorgeous Remnants collection. I did my layout on the Mayfair paper. I put a thin coat of white Gesso with a spatula on the half right side of my paper. I put purple inks on it. Then, I add details with stamps and black ink and texture with a stencil and black modeling paste. 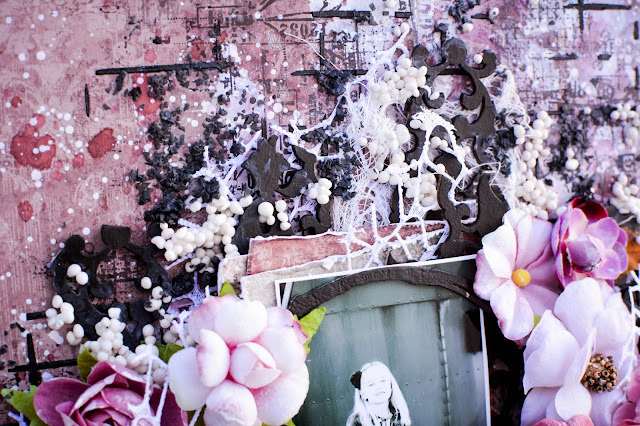 I painted with black Gesso all my chipboards. 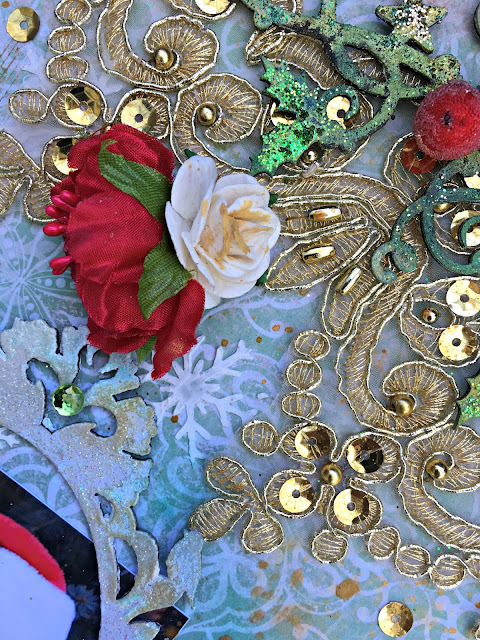 I cut in pieces the Damask Panel and put these under my flowers and my picture. I add a lot of flowers and texture with Seedlings. 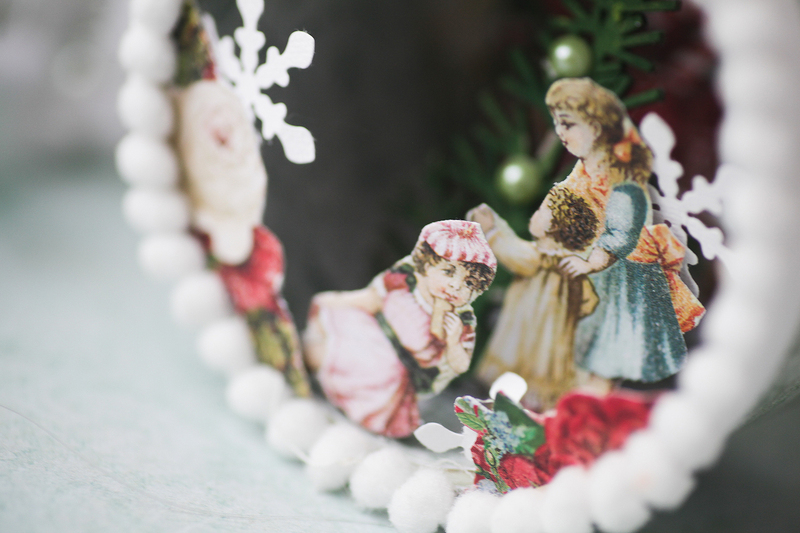 I put a thin layer of white gesso on my flowers to give them a vintage look. I hope you have found some inspiration. I wish you a nice crafty day! Fort my first layout, I have use 3 differents paper Mayfair, Chancery lane and Highgate. 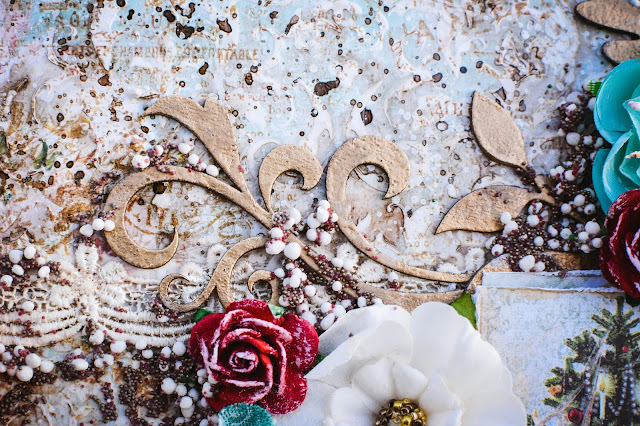 Than I have use the Red wine glitter mixed with gel medium to add texrure on my backgroud. 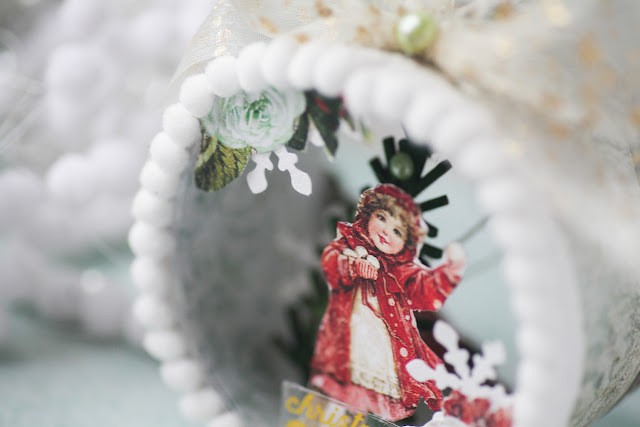 Than I have use several chippies from the coordinated chipboard to create my focal point. For this layout, I have used the Vignette paper and leaft over from Beaumont paper. First, I have mixed Red wine glitter, Tickled, Burendy and Purple haze seedling with gel medium and apply it on my backgroup trough a stensil. 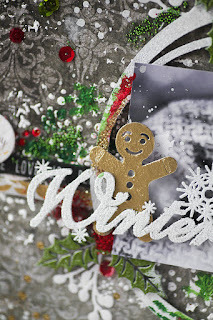 I have use Night sky embossing powder on my Krystal's boader chipboard. I use one chippies of the coordinated chipboard as my title. 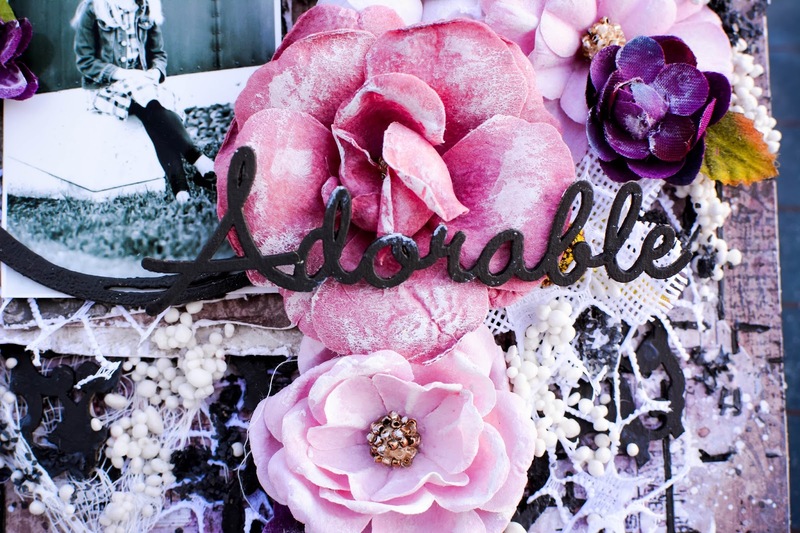 This is my favorite layout this month ! I have use the Beaumont and Devonshire paper. Than I have use a new technic for my chipoard, I apply gel medium with a paint brush and apply Meadow seeling on top of it. This is a very nice way to embellish the chipbaords. 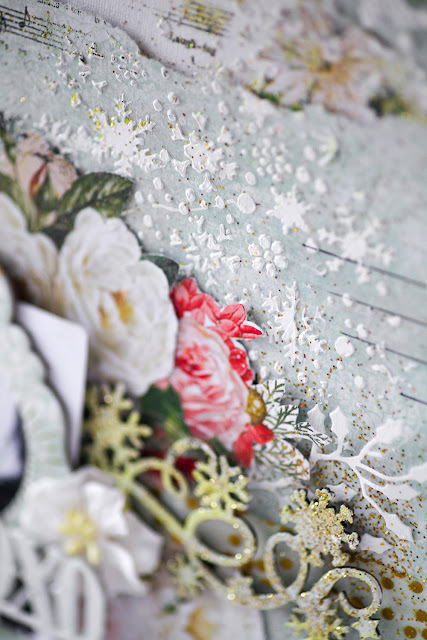 I have use the Ivory and Green Ivory embossing powder on the Branch set and Thistle spray chipboards. 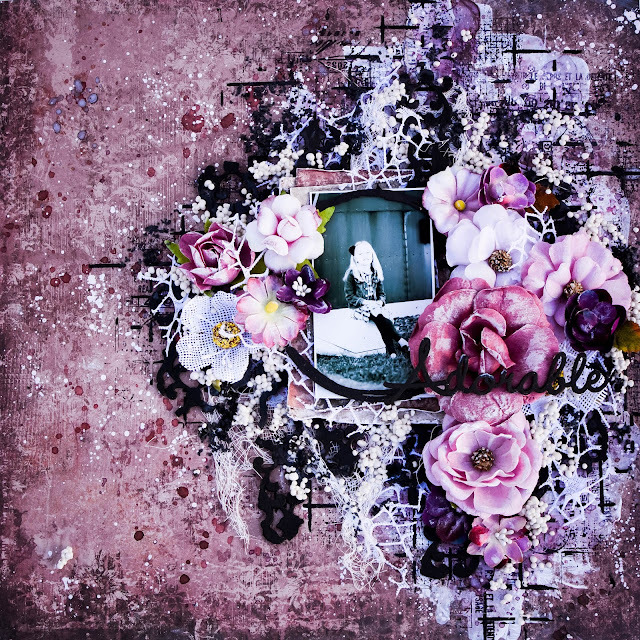 To complet my layout, I add Dark tropic lilies and Homespun bloom flowers. December inspiration by Pascale B.